It’s been over a month now, and my knees are largely better. I don’t have a whole lot to say about the race. Things started off very well, and I was running in the top 5-8% through the half-way point. I jogged the flats, downs, and mellow uphills, and hiked anything even remotely steep. I kept the calories, fluids, and salts coming in, and truly felt not just good but great. At the turnaround at Winfield I was joined by my friend Jordan, took on some poles for the hike back over Hope Pass, and my knees completely fell apart. The hike back up the pass was neither blistering nor crawling, but the pain got worse as I went up. I had to stop at the Hope Pass aid station for a while, and an amazing volunteer spent several minutes working on my legs. It helped for a few minutes but the pain came back, and the descent back to Twin Lakes was a painful crawl. By the end my knees were in such bad shape that Jordan could hear them crunching every few steps, and I dropped out as soon as I got back to Twin Lakes, 62.5 miles in, only 38.5 to go. It sounds like a long way to go but had my knees held up, I have no doubts I would’ve finished strongly. I’m hugely appreciative to my friends who came out to help me that day – Jordan, Greg, Meredith, and Nate – and wish I hadn’t dragged them up there for nothing. And I have to thank my wonderful wife for putting up with this whole-summer debacle and supporting me through it. I’ve run twice since then, a four-mile jog from home and a trail race – the same one I won a couple years ago. Things didn’t go quite so well this time around, as I finished 9th (2nd in AG). I suppose going out as pack-fodder on a beautiful day is better than doing it with a painful DNF. It was quite a summer, but I’m glad to be done, and I’m glad to be able to focus on my family. Truth be told, I was growing tired of all the running and have been looking forward to new things. There will always be new adventures, and for the foreseeable future they’re going to be enjoyable. This past weekend brought the second biggest event in the Leadman series, one that I put a lot of training time and effort towards for the sake of getting a big shiny belt buckle – including a huge three-day weekend on the bike last month. I started the weekend with an early drive to Leadville for packet pickup and killed some time before the mandatory pre-race meeting with a haircut. The meeting was a waste of time, with no relevant race information but plenty of “you’re all amazing, especially these guys who have done the race dozens of times, enjoy the near-life experience you’re about to have, etc. etc. etc.” With that over I slowly made my way to lunch and my hotel, and wound down for the afternoon/evening. My alarm came plenty early at 4am on Saturday. I microwaved some breakfast, got dressed, put on most of a tube of sunscreen, and before I knew it I was lined up in my starting corral. Earlier this year, the Rodeo guys posted up a trip they were planning through the Flat Tops Wilderness. It looked ridiculous – three days to cover 265 miles and nearly 20,000′ of climbing over mixed terrain in places bicycles are rarely seen. I didn’t know what bike would be appropriate, or if I’d even have an appropriate bike for the trip. I did know, however, that it would be perfect training for the Leadville 100 bike race. So I signed up, knowing I had a lot of work to put in before mid-July rolled around. 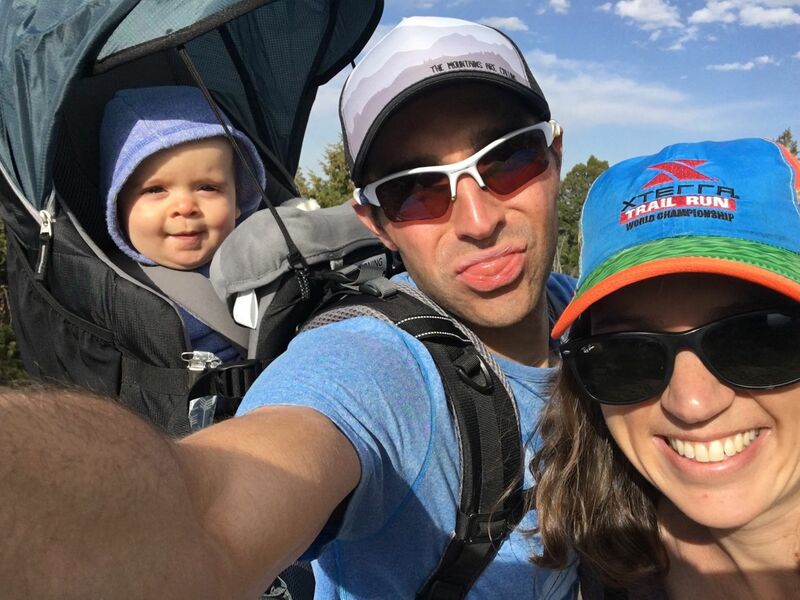 Working nights most of the summer on top of raising a family got in the way of a lot of training time, but preparing for this trip and the Leadman series were a big enough priority that I fit in what I could; even so, I was nervous in the days leading in to the weekend. The day the trip finally rolled around, I woke up to my alarm at 3, had a small breakfast and coffee, and hit the road. 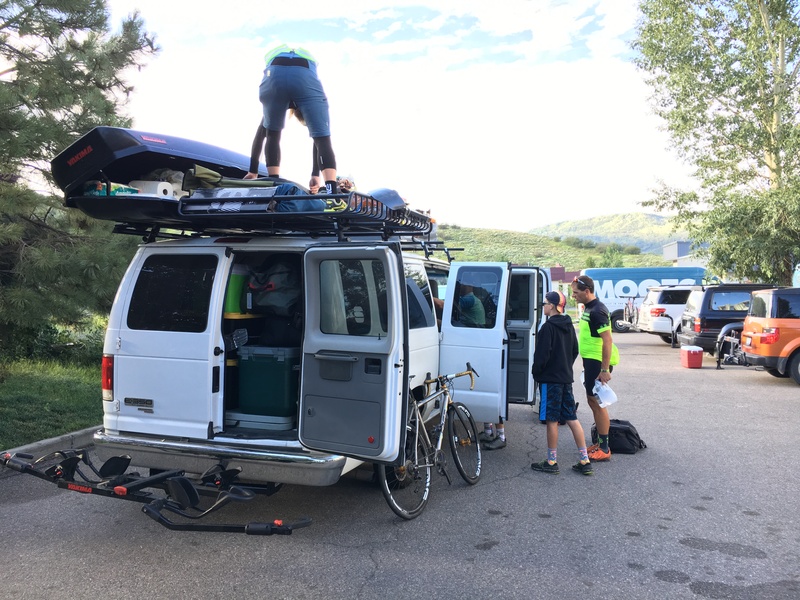 I got to Steamboat a bit early, but before I knew it we were loading up the support van and getting ready to roll out. This past weekend was one I’ve been looking forward to wrapping up for a while now. For the Leadman series, I was only required to do one of the two 50 mile races. Needing a qualifying time to get in a better corral in the 100 MTB, doing the bike race was the obvious choice. If I hadn’t, I’d start the race in the very back, behind at least 1000 people (there were ~1,350 finishers last year) and have almost no chance of finishing under nine hours. So doing the 50 mile bike race on Saturday was a given. At the same time, I went in to this series having never run an ultramarathon – so maybe it would be good to get the experience of a 50 mile run to sort out my pacing, nutrition, etc. And if I did it the day after a bike race, I’d have the bonus of doing those 50 miles on already-tired legs. And with that, another poor decision was made – to do a pair of 50 mile races back to back. The first race of this year’s Leadman series is now behind me. It was a fun one, with mostly good weather and better course conditions than could’ve been expected. I kept going back and forth on staying in town the night before or driving up the morning of, and ended up with a 3:30am alarm on Saturday, in large part due to Owen’s most recent sleep regression. Since I was treating this race as a training run, being a little tired was no big deal. As long as I could finish feeling good and drive myself home at the end of the day, I’d be happy. Training has gone reasonably well, though not amazingly so the past month. My shortest week since picking back up after Boston was about ten and a half hours combined run+bike time, and – if tomorrow goes according to plan – this week will be over 18, including a decent hike hauling Owen. I’ve had a few 20+ mile trail runs and some solid bike workouts, and I’m feeling pretty good about the Leadville Trail Marathon coming up quick. I’m reasonably confident that I’ll come out of it no slower than last time, but more importantly, feeling good. Last time I did this race I buried myself in a hole so deep it took all summer to get back out. At this point I’m actually feeling better about the 100 Run than the 100 Bike. That might be off-base. Next update in two weeks. It’s hard to believe, but Boston is coming up quick. Harder to believe is that Boston, formerly my A-race – and probably only race of the season – is essentially a warm up for what’s to come. Training is going well, hitting 50mpw consistently (if you count the miles from climbing and skiing Grays Peak a week ago) including a weekly 19+ mile run, along with a decent road ride each week and some light weights. Last Saturday (Feb 18) I went up to Grays Peak for some exercise, and ran in to Chris Tomer on the summit. We hadn’t seen each other in a few years and have been trying to connect, so that was a fun surprise. Despite gigantic sastrugi, the skiing was very pleasant and even went continuous from summit to car. Weather and life have made it difficult to keep consistent, and this coming week will probably be tougher. I’ve settled on a couple gear decisions, the main one being bike choice – I’m going to stick with my FS trail bike, make a couple upgrades, and get some race tires. A new race bike would be nice but just isn’t in the budget. I’m still figuring out shoes, both run and bike. Beyond that, trying to schedule my spring/summer training around family, work, skiing, and races is my current focus on the Leadman front.